Want to find a good moving company? Search the Internet for “moving company *your hometown*” and you’ll to turn up dozens of results. But how do you know which one can handle your move? And for the right price? And, most importantly, which one can you trust with moving your stuff? You can narrow down the list of possibilities by determining whether your move is local or long distance. Most local moving companies will do only local moves, i.e. moves that are under 100 miles and within state lines. Bigger companies can help you with long-distance (and even international) moves and shorter ones as well, but their rates are often more expensive than local companies. Once you’ve narrowed the list down to a few companies, get a few estimates and compare prices. Make sure you know exactly what’s included in the estimate by detailing what you need moved. You don’t want to find out that there’s a per-stair fee after you’ve already moved into your new 25th-story apartment. Get free moving estimates from up to six companies from our website, if you don’t have time to search on your own. When talking to a moving company, make sure to probe around to discover important information, including how long it will take them to move your stuff, any additional fees, and whether they offer any perks. Check here for more questions you should ask your moving company and the answers you should be looking for. 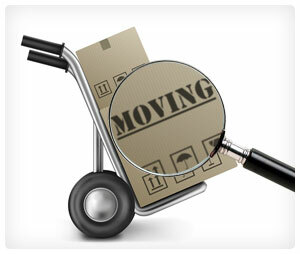 Ask friends & family – Know anyone who has moved recently? Before hopping online, check with your friends and family for moving company recommendations. A single enthusiastic review from a trusted source is better (and faster!) than combing through hundreds of online testimonials. Check references – Look at online reviews and key in on specific words, like “estimate” and “break”, to see if quoted prices were wrong or if movers were careless. Once you’ve found a mover who you trust and who understands the details of your move, it’s time to seal the deal. Make sure to get a copy of the contract and keep it with you until after you are settled into your new place.